There are some materials that are more diamagnetic than bismuth. These include superconductors (which at this time require cryogenic temperatures to work), and similar materials that exhibit "giant diamagnetism" (also at very low temperatures). But there is one material that is more diamagnetic than bismuth at room temperature, at least in one direction. That material is called pyrolytic graphite. Pyrolytic graphite is a synthetic material, made by a process called chemical vapor deposition. To make pyrolytic graphite, methane gas at low pressure (about 1 Torr) is heated to 2000 degrees Celsius. Very slowly, (one thousandth of an inch per hour) a layer of graphite grows. The graphite made this way is very highly ordered, and the layers of carbon atoms form like a crystal of hexagonal sheets. These sheets lie on top of one another like sheets of mica. 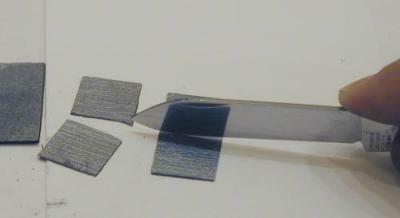 You can separate the layers with a sharp knife to make thinner sheets. Pyrolytic graphite is more diamagnetic than bismuth, but only in the direction perpendicular to the sheets of carbon. In other directions, it is still diamagnetic, but not as good as bismuth. 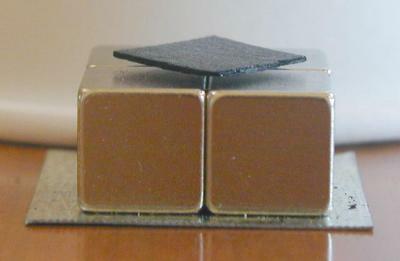 Because the density of pyrolytic graphite is lower than bismuth, (the specific gravity is 2.1), it is light enough to be levitated above a sufficiently powerful magnet. A thick piece will still be too heavy, since the material above about a half of a millimeter does not contribute much to the lift. 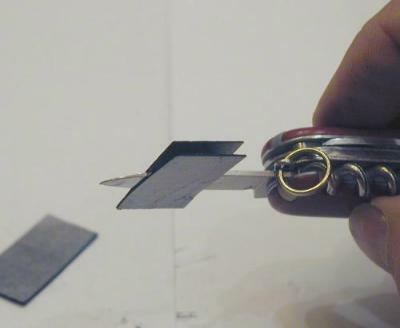 But if the piece is thin enough, it will simply slide right off of a strong magnet, and refuse to sit still on it. 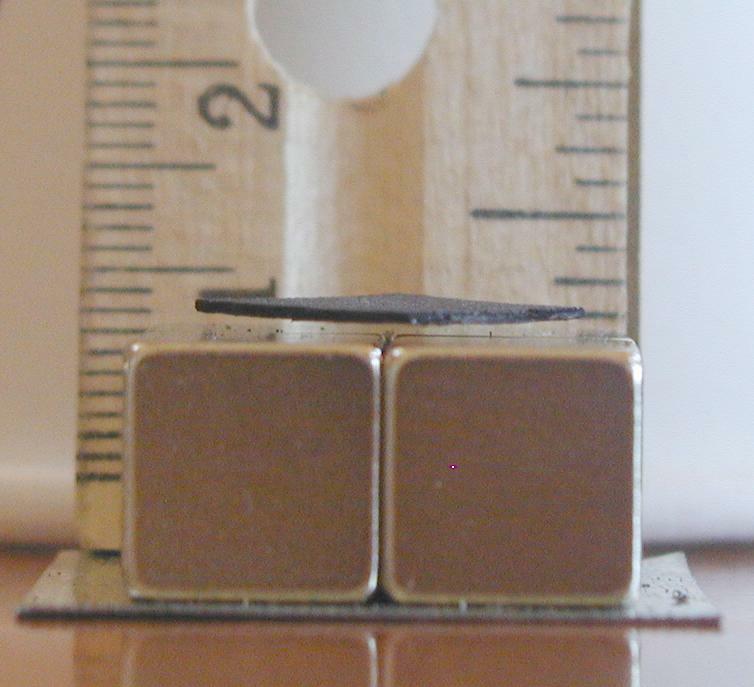 With a piece half a millimeter thick, using neodymium-iron-boron supermagnets, you can see from the photos that the piece is levitating about a millimeter above the magnets. 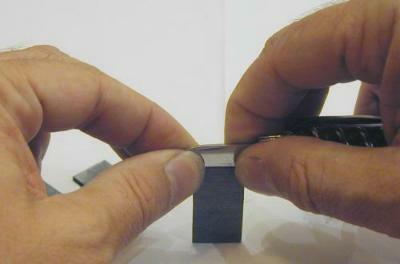 To make the pyrolytic graphite plate sit still above the magnet, we need a way to force it towards the center. We can do that by using four magnets. 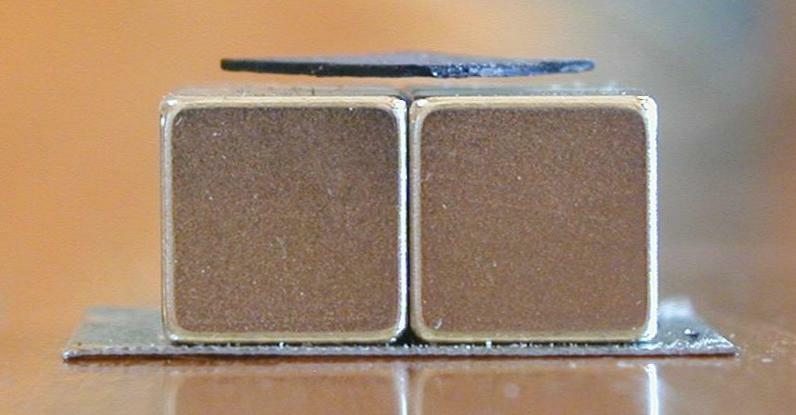 The poles of the magnets push on the diamagnetic material more strongly than other parts of the magnet. 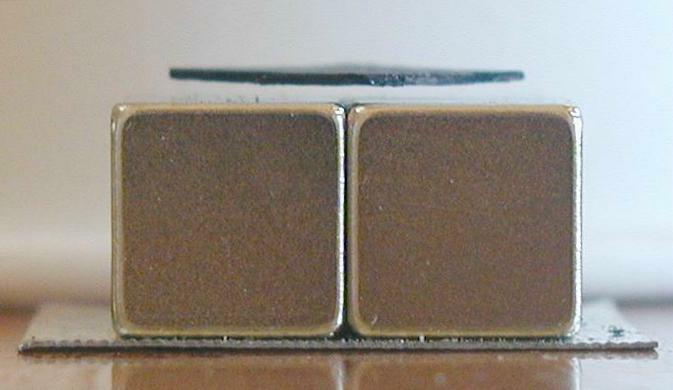 With four magnets, the four edges of the square of pyrolytic graphite will be pushed away from the four poles. If the square is slightly smaller than half the width of the four magnets (a little smaller than one magnet), then we can place it in the center, and it will be pushed to the middle and stay. Since diamagnetic materials are repelled by either pole, we can place the magnets with alternating north and south poles, and they will stick nicely to one another. I like to sit the whole array on a piece of sheet steel, so the magnets stay put. This arrangement is discussed in excruciating detail on our Message Board. The pyrolytic graphite plate floats above the magnets and springs back when you push it down with a finger. Since pyrolytic graphite is a little more diamagnetic than bismuth, it makes a great substitute for bismuth in the levitating magnet project. 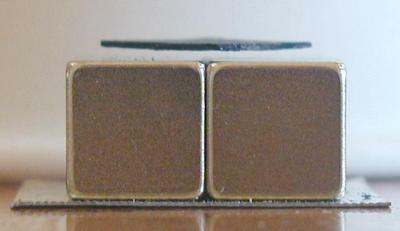 Below is a picture of a magnet spinning between two pieces of pyrolytic graphite, separated by a small piece of wood. The large magnet above it is not shown, but this is the same device we built earlier using bismuth. Pyrolytic graphite is not easy to find. The local hardware store won't be carrying it any time soon. But we carry it in our catalog, in pieces just the right size for the levitating magnet project. These pieces are 16 millimeters wide, 32 millimeters long, and between a half millimeter to a millimeter thick. 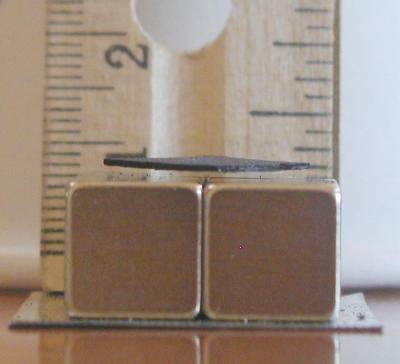 Split into thin sheets and then cut in half with a sharp knife to make 16 millimeter squares, they are perfect for levitating above four magnets. 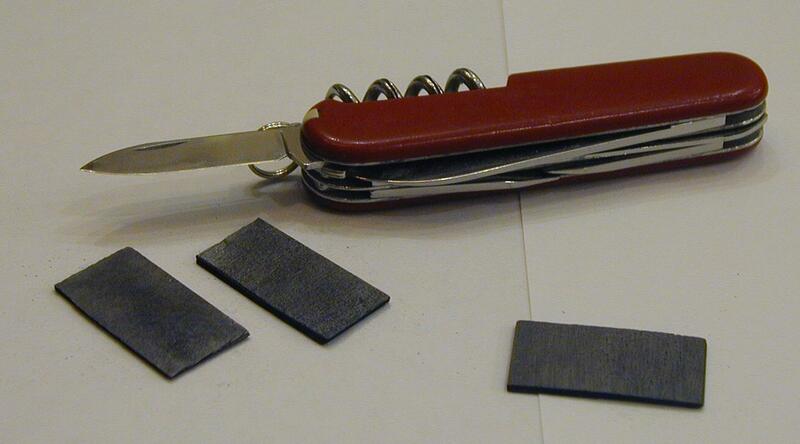 The knife should be very thin, so it splits the graphite cleanly, without breaking it. A razor blade or a utility knife would work better than the small blade of my swiss army knife, but the army knife works if you're very careful and practised at it. Place the blade carefully in the middle of the edge of the graphite. Slowly push the blade in with a slight rocking motion. The graphite will make a nice clean sound as it starts to split. Sometimes you will get one thin piece and one thicker piece after they are split. 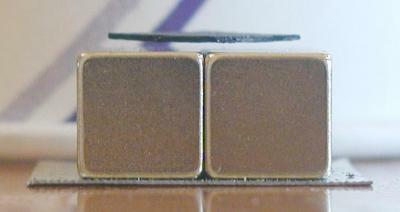 You can often split the thicker piece again, giving you three pieces. If you are very skilled, you can get four pieces, but you will break a few gaining that skill. Lastly, once the slices are very thin, you can cut them in half by rocking the sharp knife over the middle of each one. The pieces will snap and may fly some distance unless you put a finger over them to hold them down. 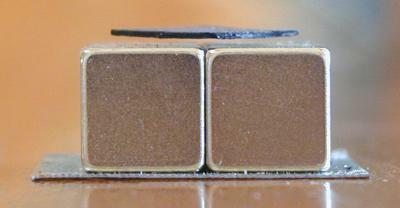 The thick graphite is too heavy to float on the magnets. The nice thin sheets you split it into will float, and the thinnest ones will float highest. Order super magnets and pyrolytic graphite here.